Hello all, and welcome back! Last weeks post was an exciting turn out, and I hope everyone had an enjoyable week. Now ladies and gents, are you ready to flex your imaginations? 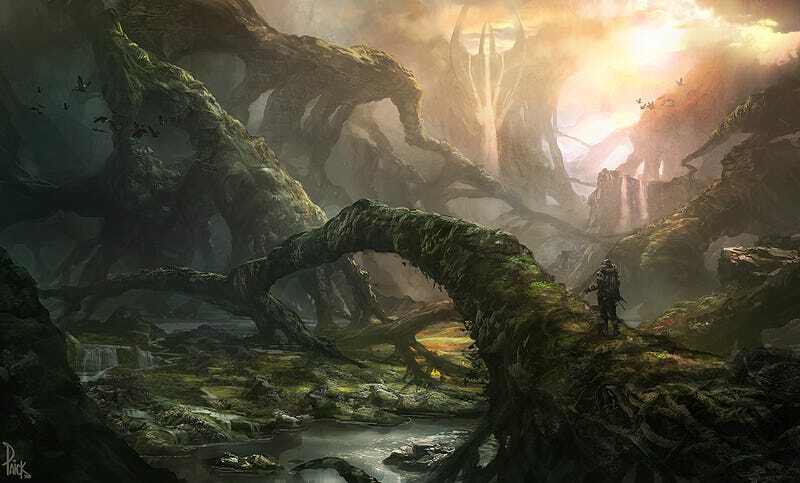 This weeks art is from James Paick, whose work can be found online here. While I am not sure about everyone else, but last week was mostly spent playing Destiny, and also trying to find a game to review. I regretted my choice soon after playing it, but I wasn't about to put it down. You can read the review, but I highly recommend not playing it. So, back to writing... today's topic is about setting: Which one do you find yourself drawn to? Are you a fan of futuristic, sci-fi? Possibly a fan of the more fantasy setting with orcs and goblins? How about current times set in an alternate universe? I for one find myself pulled towards the works of fantasy, and blame it mostly on LOTR and D&D. There is something intriguing about all of the mysticism with sorcery and potions that I love to explore. As far as the set piece goes, what do you think the lone traveler is doing? Are they out scouting the area for enemies, or possibly guarding the structure in the background? Could he be a lone cook who ventured too far to find a secret ingredient? Who knows! Let your imaginations run wild!